Missed the first article? 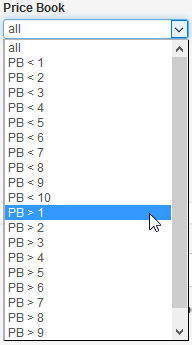 No problem, fundamental screening filter documentation part 1 can be found here. In this second article, we will discuss the following fundamental filtering options in the stockscreener (click on the image below to go to the screener immediately). Perhaps not as well known as the price / earnings ratio, but surely a ratio that has its value when it is used correctly. 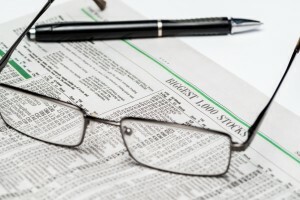 The ratio is calculated by dividing the share price through revenue per share. By default, this ratio is calculated over the last 12 months. The ratio is therefore based on revenue and not on profit. After all, sales are less sensitive to “smart accounting” than the profit a company reports. The lower the price/sales ratio, the cheaper the company and the more interesting for investors. Note that a high turnover does not automatically mean a company makes a lot of profits (the company can only have a very small profit margin). But it can lead to a strong improvement in profits if the company succeeds in boosting the profit margin with the same revenue. Because revenue is used to calculate this ratio, this is a formula that is used primarily for companies that have no or very little operating profit. As with the price/earnings ratio, you should only use it to compare companies that are active in the same sector and/or industry because the profit margins per sector can vary considerably. An example to finish: Company A has generated revenue of $ 1,000,000 in the last 12 months. There are a total of 200,000 outstanding shares and the price of the share amounts to 20$. The turnover per share is therefore 1,000,000 / 200,000 = 5 $. We then get the price / turnover by dividing the share price (20) by revenue per share (5). A next ratio in our stockscreener is the price/book value. This is obtained by dividing the price of the share by the company’s book value (based on the last quarter). The book value consists of the total assets of a company (buildings, machinery, stocks, etc.) minus all the debts that the company has. A low book value (as compared to sector partners) is therefore an indication that the company is “cheap”. However, be careful with a low book value (<1), which means that the shareholders want to pay less than the residual value of the company based on its assets. Either the company is really a bargain or there is fundamentally something wrong (bad prospects for example). This filter tells us something about the profit growth a company realizes. 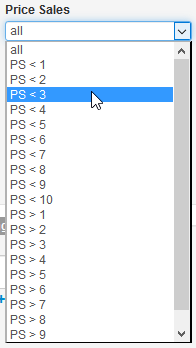 There are several intervals on which this filter can be used. 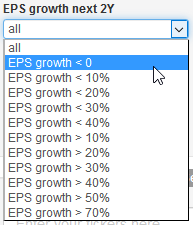 For example, you can choose EPS Growth 1Y, which compares the earnings growth of the last twelve months to the previous 12 months. 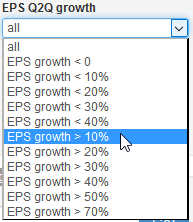 The EPS Growth 5Y calculates the average growth year on year of the past 5 full years. Another possibility is EPS Growth next Y, which compares earnings growth for the current year with an estimate of earnings growth for next year. 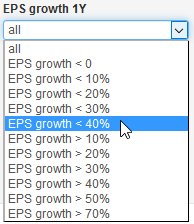 EPS Growth next 2Y goes one step further and compares current earnings growth over the next two years (estimates). EPS Growth Q2Q does not use full years but only quarters. It compares the earnings in the last reported quarter to the earnings in the same quarter in the year before. (For instance Q1 17 will be compared to Q1 2016). Profit growth per share is an important factor to accurately appreciate a company. Assume that company A achieves a profit per share of 5 and company B gains a per share of 7. At first sight, company B seems to be a better option due to higher earnings per share. However, if the following year shows that earnings per share for business A have risen from 5 to 6 and for company B from 7 to 8, the situation is slightly more nuanced… After all, profit growth for company A is 20% while for company B ‘only’ +/- 14%. Large-scale companies will realize a rather stable but slightly less strong profit growth, while the same profit growth will rather be more volatile in young (growth) companies. Next time (part 3) we will continue with the remaining filtering options in ChartMill!